The Cape Royale features spacious and modern suites, with fantastic Equinox spa and the matchless Sky Bar, with its sweeping views of the city, Devil’s Peak, Signal Hill, the Green Point Stadium and the harbor. The diagram drawings of European architecture in the lobby and elevators are one part of the many touches that set the Cape Royale apart among big hotels in Cape Town. The Cape Royale overlooks the spectacular seafront of Green Point, a luxurious haven in the midst of the busy city. The grand marble reception greets guests, and the hotel’s open airy walkways lit by natural light through the glass ceiling sets this property apart. The Cape Royale Luxury Hotel & Spa houses 32 suites, with a selection of 1 bedroom, 2 bedroom, and 3 bedroom suites. There are also 2 penthouse-style villas on the 9th floor, with a private butler service, driver and chef on call. Double glazed windows in all suites block city noise from the streets below. Privacy and intimacy are characteristic of these suites and guests can sit back and enjoy the generously sized Juliet balconies partially overlooking Signal Hill or Table Mountain, the perfect setting for a private and romantic dining experience. Perfect for the smaller family, this 2 bedroom suite has ocean views and a Scandinavian decor. Sky Bar is a rooftop bar and pool area available for guests, with a palm-lined, covered restaurant and bar area, and one of the most beautiful views in the city. 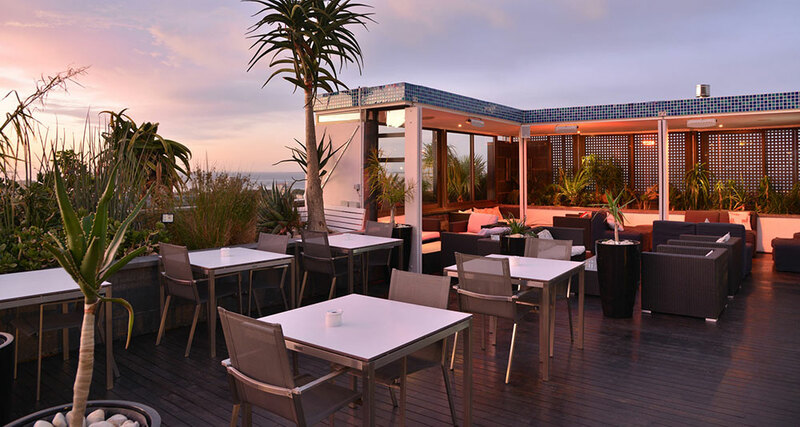 This is the best spot in Cape Town to enjoy sundowners. Bistro 1800 is the hotel’s well-known and highly rated restaurant and is one of the best steakhouses in Cape Town. This contemporary restaurant draws its name from the imported grill that seals steaks at 1800 degrees Fahrenheit, and regulars are treated to their own engraved steak knives. The Cape Royale offers complimentary transfers within a 5km radius of the hotel; guests can thus take transfers into the Waterfront, Camps Bay and the vibrant city bowl. The hotel is also home to the first class Casuarina Wellness Centre and Spa, a tranquil space to escape for a massage and other treatments. Want to see Cape Royale as part of a trip? Enquire today to let us help build your holiday.